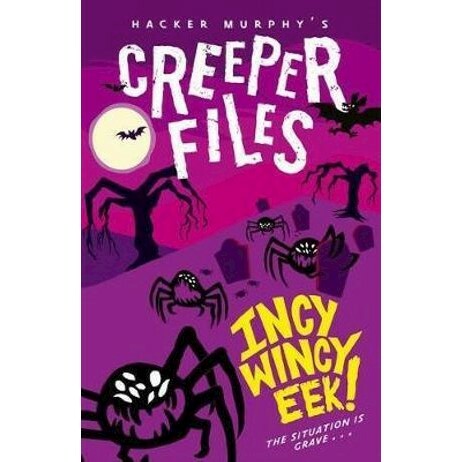 Creeper Files Incy Wincy Eek! : Incy, Wincy Eek! The situation is grave. Strange things are happening in the chuchyard . . . and I don't mean the weird cat who never seems to blink. There's a scuttling sound and a huge cobwebby plant - oh, and not to mention the hideous half-man-half-plant monster who is out for revenge. And as we all know, revenge comes in all shapes and sizes - including enormous and eight-legged! Maybe reading the Creeper Files will keep you safe. Maybe it'll keep you alive. Maybe - just maybe - this story wiill help ensure you won't become a victim of the monster known only as . . . The Creeper.Fun, accessible fiction, ideal for readers who want action-packed excitement, humour, and horror.Goosebumps for a new generation!